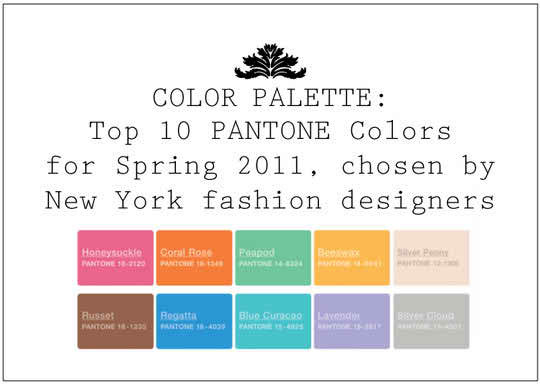 Pantone, the world-renowned authority on color has announced their Top 10 Pantone Colors for Spring 2011! This list was carefully chosen by New York Fashion Designers! I wanted to take a moment to share these colors with you because #1, I think the choices really are beautiful and # 2, I think that if you're a Spring bride and you're still trying to figure out the perfect palette for you, you might want to consider these! Honestly, there are so many great palettes to be made among these 10 fun colors! Here are some of the Spring Boards that I've made in the past that include some of these great Spring colors! I hope you are loving the top 10 Spring Pantone colors as much as I am! And remember, what's best is that if you do choose any of the Pantone colors to be a part of your palette, you can easily accessorize your wedding by shopping Pantone Wedding by Dessy! They have bridesmaid's dresses & all kinds of accessories for your bridal party! So tell me, what colors are you using for your wedding this Spring? 19 Comments " Top 10 PANTONE Colors! " Love the honeysuckle and russet combination. great collection of colors, we're loving this. wow, you are so great with color! thanks for sharing. great post! would love to see more posts like this one! great choices! love your palettes. I don't think there is one I don't love. Hi wonderful color palettes. Truly inspiring. Loved this so much I blogged about it and linked back to you! Oh my, seeing your lovely post may make it even harder for a bride to choose! You've presented the possibilities so deliciously! So tastefully done! Can't wait to see weddings in these colours! Love the Honeysuckle and Silver Cloud combo! So gorgeous, I love them.